When it comes to Sci-fi comics, one of the hardest things to come by is a writer and artist who know how to create a unique world without making it overly complex. Too often we make the mistake of looking at any Sci-fi piece of work through a Star Wars or Star Trek lens. This inevitably sets us up for disappointment when the book or movie fails to live up to that expectation. 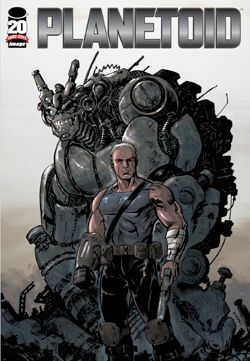 While Planetoid #1 from Image Comics stands on its own as an original idea, the overall tone and feel of it reminds me of a tale you might hear at the Cantina between Han Solo and some of his old smuggling buddies. Planetoid is the brainchild of Ken Garing who pens, draws, and letters the entire story. The tale starts off with a pilot in a ship getting pulled into the atmosphere of an unknown planet. Unable to control his ship, he is forced to eject and parachute down to the surface of the planet below. The first few pages are very light in dialogue, but the art is concise at its portrayal of the mystery and loneliness that one would feel being in this type of situation. The planet is desolate and seemingly void of life. The only visible landscaping is broken down machines and what appears to be an abandoned factory. The pilot uses an interactive analytical assistant to help guide him through the pitfalls of being on foreign soil. After analyzing the area for contents of the atmosphere, signs of life, and possible radio transmissions, the pilot learns that there isn’t much to this place that can be detected from where he is. He takes a quick look at his survival supplies, dons a filtration mask, and we are off on an adventure with a guy whose name we have yet to know. Much of the book is the main character navigating through this wasteland and the dangers he finds along the way. The art is a perfect reflection of the gritty reality he has been cast in to. Ken Garing’s lines are drawn moderately thick and deliberately, with rough edges and dark shadows. The color palette primarily consists of gray, black, brown, and copper reflecting the industrial wasteland that surrounds him. Towards the end of the book we get a better sense of why he is trapped on this planet and what sort of perils await him in the future. He meets up with an old man who helps him understand where he is and why he can never leave. This also gives Ken Garing a chance to introduce the main character, Silas, and tell a bit of his history as well. Planetoid #1 is the perfect example of what a first issue should be. While I was initially worried about the lack of words on the first four or five pages, the end of the book makes up for it and you come to realize that the art does a tremendous job of telling the story early on. It makes for a nice slow build up to the end where you are chomping at the bit to find out who and what is on this planet and how Silas is going to survive. Or perhaps more importantly, how is he going to leave. Parental concern: Some foul language. I know I shouldn’t do this but I saw the cover and passed on this the last time I was in my local store… After this review I’m really regretting my decision. I too was kind of thinking this wouldn’t be much going in, but it really captured my imagination in a very subtle kind of way. Just got done reading this. What an issue! Not what I was expecting at all, and it’s got me for at least the rest of the arc. The artwork fit very well for this. Dark, gritty, hard edged. Perfect for this story. The storyline itself was good too. I’d like to know more about this world, and about Silas, the main character.